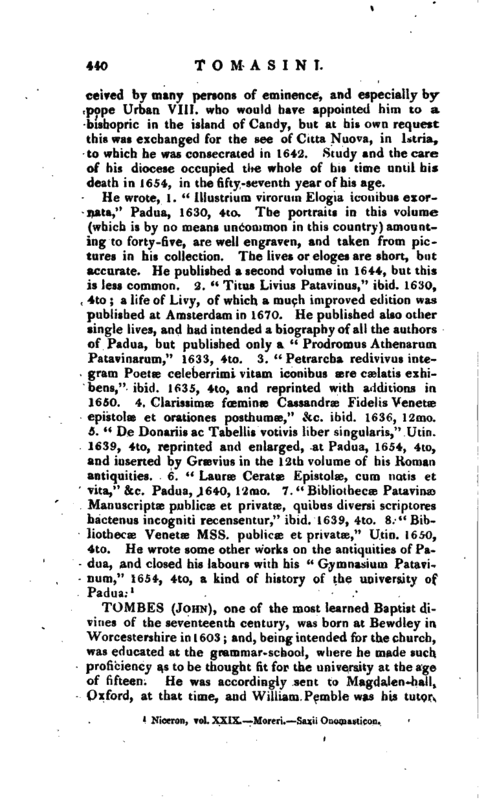 , one of the most learned Baptist divines of the seventeenth century, was born at Bewdley in Worcestershire in 1603 and, being intended for the church, was educated at the grammar-school, where he made such proficiency as to be thought fit for the university at the age of fifteen. He was accordingly sent to Magdalen-hall, Oxford, at that time, and William Pcmble was his tutor. | Here he acquired such distinction for talents and learning, that on his tutor’s death in 1624, he was chosen to succeed him in the catechetical lecture in Magdalen-hall. This he held with great approbation for about seven years, during which he was, amongst other pupils, tutor to Mr. Wilkins, afterwards bishop of Chester. 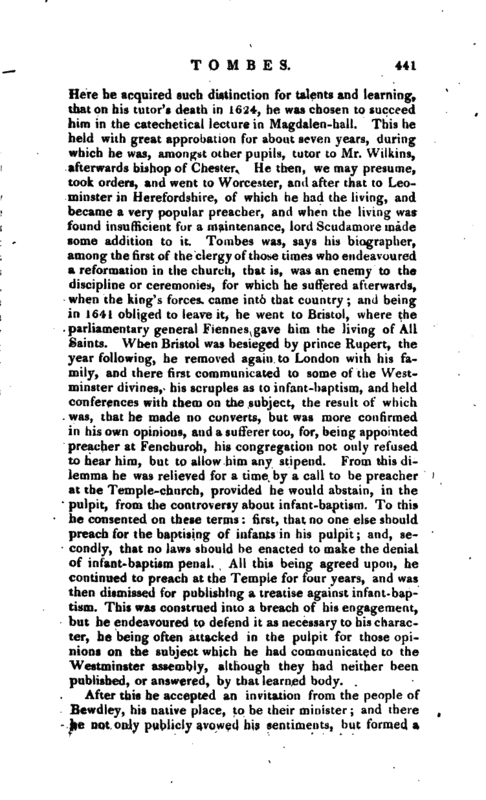 He then, we may presume, took orders, and went to Worcester, and after that to Leominster in Herefordshire, of which he had the living, and became a very popular preacher, and when the living was found insufficient for a maintenance, lord Scudamore. made some addition to it. Tombes was, says his biographer, among the first of the clergy of those times who endeavoured a reformation in the church, that is, was an enemy to the discipline or ceremonies, for which he suffered afterwards, when the king’s forces came into that country; and being in 1641 obliged to leave it, he went to Bristol, where the parliamentary general Fiennes gave him the living of All Saints. When Bristol was besieged by prince Rupert, the year following, he removed again to London with his feu mily, and there first communicated to some of the West* minster divines, his scruples as to infant-baptism, and held conferences with them on the subject, the result of which was, that he made no converts, but was more confirmed in his own opinions, and a sufferer too, for, being appointed preac-her at Fenchurch, his congregation not only refused to hear him, but to allow him any stipend. From this dilemma he was relieved for a time by a call to be preacher at the Temple-church, provided he would abstain, in the pulpit, from the controversy about infant-baptism. To this he consented on these terms: first, that no one else should preach for the baptising of infants in his pulpit; and, secondly, that no laws should be enacted to make the denial of infant-baptism penal. All this being agreed upon, he continued to preach at the Temple for four years, and was then dismissed for publishing a treatise against infant-baptism. This was construed into a breach of his engagement, but he endeavoured to defend it as necessary to his character, he being often attacked in the pulpit for those opinions. on the subject which he had communicated to the Westminster assembly, although they had neither been published, or answered, by that learned body. After this he accepted an invitation from the people of Bewdley, his native place, to be their minister; and there he not ojily publicly avowed his sentiments, but formed a | biptist church, or sect, while he continued minister of tho parish, and had also the parsonage of Ross given to him. This last he resigned on being made master of Ledbury hospital, and his parishioners at Bewdley having forsaken him on account of his opinions on baptism, he was restored to his first living at Leominster; and that and Bewdley, amidst all the disaffection of the parishioners, he held till the Restoration. Notwithstanding his differing in opinion with the generality of his brethren, he was, in 1653, ap-. pointed one of the triers, or those appointed to examine and approve candidates for the ministry. In this office he appears to have procured a sort of toleration for the baptists, for at the restoration several of that persuasion were found in possession of livings. Crosby’s Hist, of the Baptists.—Ath. Ox. vol. I.—Calamy.—Letters by eminent Persons, 1813, 3 vols. 8vo.